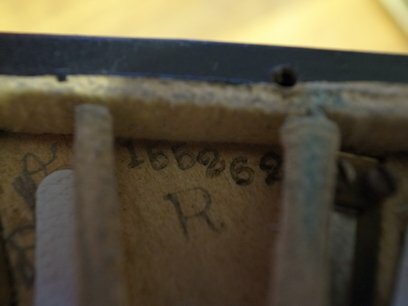 Hi, any experts on Lachenal Salvation Army concertinas? Just acquired an A flat/ E flat 30 key, serial number on a slip of paper 162462. Would be grateful for any info. I also have Lachenal A flat/ E flat (but retuned to G/D) wood end model. 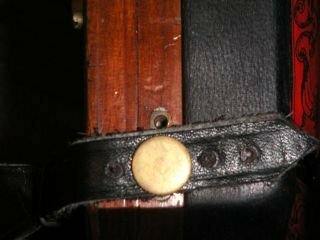 It has additional metal parts with screw-hole under the LHS hand strap which accommodates band lyre. I do. Mine is 155862 . Your No. 162462 is easy to date. I have a bill of sale for one less than 500 numbers later than yours--No. 162849 receipt dated 1898. Lachenal was building a lot of Anglos in the 1890s. Though your No 155862 was about 7000 less that the No. 162849, it was probably made only one year earlier, in 1897. In my data, your No 155862 is shown as 26 Key originally in Ab/Eb and retuned ot C/G; wood fretwork, bone buttons, brass reeds, and 5-fold bellows. I would appreciate knowing if this description is correct. A note on the dating estimates that I provide: I usually say "circa" rather than a singe definite year. Today, you may have to wait months or years to acquire your new high quality concertina. But Lachenal had a little showroom with a Dutch Daly poster on the wall and an inventory of concertinas from which one or more could be putchased on a first visit. So the instrument may have laid a while in the showcase after being built a little earlier than the year shown on the sales receipt. Also note that it is imperative to eliminate sales receipt for purchases of used instruments. I checked inside again and realized that the number looked like 155262 rather than 155862 (please see the photo). It was 30 key in Ab/Eb retuned to G/D, wood fretwork, steel reeds, 6-fold replacement bellows. This concertina was also discussed here. Sorry for the mistake. I hope this helps. These SA instruments weren't only supplied by Lachenal. stand). Original tuning (A ≅ 445 Hz.). However, this is really to let you know that at least two Salvation Army tutors exist for their concertinas. The first is available on't'internet - it may be useful? Concertina, Salvation Army Book Store, 1888. Tutor, Salvation Army Publishing Offices, c. 1905.